St. Thomas is home to over 40 beaches from shell-ridden shores to soft white sand, abundant coral and marine life to quiet and clear. While the island has many secret coves and strips of sand only accessible by boat or a hike off the beaten path, St. Thomas has over a dozen beaches, each with their own charm, that are easily accessible and available on Public Sightseeing and Beach Hopping Tours and Private Beach Hopping Tours. With so many options, St. Thomas has the perfect Caribbean beaches you’ve dreamt of for months, and I’ve got your local guide to find that splendid shore. Northside Beaches- The Northside of St. Thomas is known for lush foliage and spectacular views of the British Virgin Islands. The Northside is quieter than other areas of St. Thomas, with less restaurants and shops and sparser population, but the beaches are what draw people in. This side of St. Thomas features hidden beaches, one of the top 10 beaches in the world, and local beach hangouts. Magens Bay- Perhaps the crown jewel of the U.S. Virgin Islands, Magens Bay has been featured in films and is well known as one of the best beaches in St. Thomas and one of the top 10 beaches in the world. Though locals may debate whether it’s the best beach on island, Magens puts St. Thomas on the map when it comes to Caribbean destinations, and her beauty and appeal is undeniable which is why so many brides have chosen Magens Bay Beach for their destination wedding. At a mile long, Magens is the largest beach in St. Thomas and features a restaurant, bar, shops, beach chair and watersport rentals, facilities, picnic benches, pavilion rentals, and lifeguards on duty to facilitate a full day at this Caribbean gem, not to mention world class views from Drake’s Seat, on the journey down to the Magens Bay, St. Thomas. Hull Bay- Hull Bay is known for its local St Thomas charm. You’ll find local fisherman setting their lines and families out with their dogs for a beach day. The restaurant features local dishes and drink specials and occasionally hosts live music in the evenings. Hull Bay also has pretty good snorkeling with lots of coral growth and plentiful fish. I especially love Hull Bay at St. Thomas sunset. East End Beaches- The East End is known for Red Hook and resorts. It’s more densely populated and condensed, making it easy to grab a bite and drive from beach to beach for a day of exploration. The East End of St. Thomas contains more beaches than any other part of the island, and aside from Magen’s Bay, also has the more notable beaches. Coki Point- Coki Beach is best known for its abundant schools of fish and great snorkeling in St Thomas. With facilities, lifeguards, watersport and beach chair rentals, and beachside restaurants, Coki is fit for a day of fun at the beach. Because of its popularity, Coki is know to be heavily populated on cruise ship days. Check the cruise ship schedule to avoid crowds. Sapphire Beach- Sapphire Beach is properly named for its bright blue St. Thomas water. In addition to beachside food and beverage service and abundant coral and marine life, Sapphire beach has its own unique charm with the white-cheeked pintail ducks roaming the shore and the beautiful rock formations at the far end of the beach at Sapphire Point, another popular St. Thomas wedding location for its unique beauty. Lindquist (Smith Bay Park)- Lindquist Beach is protected by the Magen’s Bay Authority and is one of the most pristine beaches in St. Thomas. You’ll find fantastic views of St. John and the British Virgin Islands along with facilities, picnic tables, and pavilions for rent at Lindquist. Chickens and occasional white-cheeked pintail ducks are known to comb the shores of Lindquist, and the water at this beach is particularly lovely at the St. Thomas sunset hour. Secret Harbor- Secret Harbor is located at Secret Harbor Beach Resort, but this resort is more open to the public than most on St. Thomas and welcomes cruiseshippers and island tours. Secret Harbor is one of the top snorkeling spots on St. Thomas and has watersport rentals and two great beachside restaurants. This is a great family beach with shallow water snorkeling and a floating dock. West End Beaches- The West End of St. Thomas is pretty quiet, with sparse population, the airport, and the University of the Virgin Islands, but the beaches are truly spectacular with crystal clear water and unique views of close encounters with the landing planes. Despite their nearness to the airport, these beaches are quiet and just as beautiful as any other St. Thomas beaches. Brewers Bay- Located next to UVI, Brewers Bay is one of the longer beaches in St. Thomas with unique views of planes landing at the Cyril E. King airport. Brewers features soft sand, local food trucks, and pretty good snorkeling with stingrays and conch known to frequent the bay. Lindbergh Bay- Lindbergh Bay is another St. Thomas hotel-front beach that welcomes the public. This beach contains two waterside restaurants and watersport and beach chair rentals. Lindbergh Bay is used by the St. Thomas Marine Biology program at UVI and features unique views of planes passing overhead to land at Cyril E. King airport. Hotel Beaches- While all St. Thomas beaches are public, these hotel beaches are more exclusive. Chairs are usually reserved for guests and access may be limited, but you can experience any of these beaches and layout on the shore without question. Some general tips for visiting St. Thomas beaches on your vacation: remember to leave coral and marine life undisturbed when snorkeling, be a courteous beachgoer (clean up after yourself, avoid playing loud music, never bring glass bottles to the beach), and don’t forget to reapply sunblock and/or bug spray (noseeums and mosquitos come out at sunset). If you’re looking to sample the beaches and add some extra activity to your beach day, try a St. Thomas Shopping, Sightseeing, and Beach Tour or a Private St. Thomas Sightseeing and Beach Hopping Tour. An oasis can be found at any beach in St. Thomas. Find yours on your St. Thomas vacation. Be sure to check out our Excursions page to book the best beach excursions on St. Thomas! If you have any questions about St. Thomas beaches or any inquiries about the island, call or e-mail us for authentic local insight! Explore the best beaches in St. Thomas with our tips and experience. 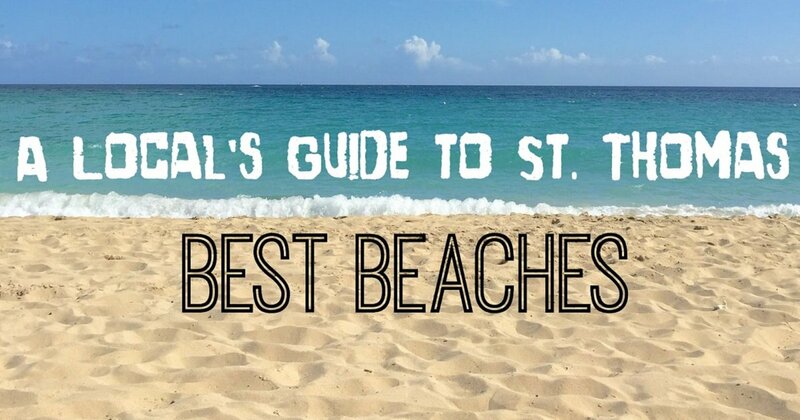 Get the most out of your St. Thomas vacation with a local guide to the beaches.